During his Software Engineering MSc, Des Willans was working for Avolites, a small but specialist company based in west London, which manufactures lighting consoles, dimmers and a number of other lighting control units for the production lighting industry. Its products are used worldwide for TV, film and music events, including the recent Bond film Casino Royale and The Killers tour. 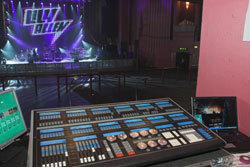 Des developed an application enabling remote control of Avolites' consoles over a wireless LAN. This allows lighting fixtures to be controlled so that pre-programmed scenes and effects can be triggered from anywhere in an event arena. Avolites' consoles run on an embedded Windows XP operating system, including Microsoft's Web Server IIS, which hosts Des' user interface. Des enhanced the console with a .NET Web Service written in C# to expose console commands to applications and an ASP.NET application to provide a user interface accessible by handheld PDA browsers.